The Upper Paleolithic (or Upper Palaeolithic, Late Stone Age) is the third and last subdivision of the Paleolithic or Old Stone Age. Very broadly, it dates to between 50,000 and 10,000 years ago, roughly coinciding with the appearance of behavioral modernity and before the advent of agriculture. Modern humans (i.e. Homo sapiens) are believed to have emerged about 195,000 years ago in Africa. Although these humans were modern in anatomy, their lifestyle changed very little from their contemporaries, such as Homo erectus and the Neanderthals. About 50,000 years ago, there was a marked increase in the diversity of artifacts. In Africa, bone artifacts and the first art appear in the archeological record. Between 45,000 and 43,000 years ago, this new tool technology spread with human migration to Europe. The new technology generated a population explosion of modern humans which is believed to have contributed to the extinction of the Neanderthals. The Upper Paleolithic has the earliest known evidence of organized settlements, in the form of campsites, some with storage pits. 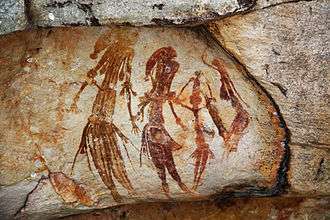 Artistic work blossomed, with cave painting, petroglyphs, carvings and engravings on bone or ivory. The first evidence of human fishing is also noted, from artifacts in places such as Blombos cave in South Africa. More complex social groupings emerged, supported by more varied and reliable food sources and specialized tool types. This probably contributed to increasing group identification or ethnicity. By 50,000–40,000 BP, the first humans set foot in Australia. By 45,000 BP, humans lived at 61° north latitude in Europe. By 30,000 BP, Japan was reached, and by 27,000 BP humans were present in Siberia above the Arctic Circle. At the end of the Upper Paleolithic, a group of humans crossed the Bering land bridge and quickly expanded throughout North and South America. Firstly among the artifacts of Africa, archeologists found they could differentiate and classify those of less than 50,000 years into many different categories, such as projectile points, engraving tools, knife blades, and drilling and piercing tools. These new stone-tool types have been described as being distinctly differentiated from each other; each tool had a specific purpose. The invaders, commonly referred to as the Cro-Magnons, left many sophisticated stone tools, carved and engraved pieces on bone, ivory and antler, cave paintings and Venus figurines. The Neanderthals continued to use Mousterian stone tool technology and possibly Chatelperronian technology. 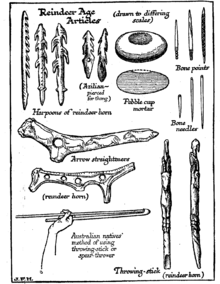 These tools disappeared from the archeological record at around the same time the Neanderthals themselves disappeared from the fossil record, about 40,000 years ago. Settlements were often located in narrow valley bottoms, possibly associated with hunting of passing herds of animals. Some of them may have been occupied year round, though more commonly they appear to have been used seasonally; people moved between the sites to exploit different food sources at different times of the year. Hunting was important, and caribou/wild reindeer "may well be the species of single greatest importance in the entire anthropological literature on hunting." European LGM refuges, 18,000 BC. The climate of the period in Europe saw dramatic changes, and included the Last Glacial Maximum, the coldest phase of the last glacial period, which lasted from about 24,500 to 18,000–17,000 BC, being coldest at the end, before a relatively rapid warming (all dates vary somewhat for different areas, and in different studies). During the Maximum, most of Northern Europe was covered by an ice-sheet, forcing human populations into the areas known as Last Glacial Maximum refugia, including modern Italy and the Balkans, parts of the Iberian Peninsula and areas around the Black Sea. This period saw cultures such as the Solutrean in France and Spain. Human life may have continued on top of the ice sheet, but we know next to nothing about it, and very little about the human life that preceded the European glaciers. In the early part of the period, up to about 30,000 BC, the Mousterian Pluvial made northern Africa, including the Sahara, well-watered and with lower temperatures than today; after the end of the Pluvial the Sahara became arid. The Last Glacial Maximum was followed by the Allerød oscillation, a warm and moist global interstadial that occurred around 11,500 BC to 10,800 BC. Then there was a very rapid onset, perhaps within as little as a decade, of the cold and dry Younger Dryas climate period, giving sub-arctic conditions to much of northern Europe. The Pre-Boreal rise in temperatures also began sharply around 9600 BC, and by its end around 8501 BC had brought temperatures nearly to present day levels, although the climate was wetter. This period saw the Upper Paleolithic give way to the start of the following Mesolithic cultural period. As the glaciers receded sea levels rose; the English Channel, Irish Sea and North Sea were land at this time, and the Black Sea a fresh-water lake. In particular the Atlantic coastline was initially far out to sea in modern terms in most areas, though the Mediterranean coastline has retreated far less, except in the north of the Adriatic and the Aegean. The rise in sea levels continued until at least 5500 BC, so evidence of human activity along Europe's coasts in the Upper Paleolithic is mostly lost, though some traces have been recovered by fishing boats and marine archaeology, especially from Doggerland, the lost area beneath the North Sea. Numerous Aboriginal stone tools were found in gravel sediments in Castlereagh, Sydney, Australia. At first when these results were new they were controversial, more recently dating of the same strata has revised and corroborated these dates. Denisova hominins live in the Altai Mountains (Russia, China, Mongolia, and Kazakhstan). Early cultural centre in the Swabian Alps, earliest figurative art (Venus of Schelklingen), beginning of the Aurignacian. Lion-Human created from Hohlenstein-Stadel. It is now in Ulmer Museum, Ulm, Germany. 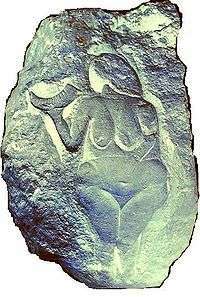 Venus of Laussel, an Upper Paleolithic (Aurignacian) carving. Human populations around Europe learn how to harden clay figures by firing them in an oven at high temperatures. Sydney was occupied by Aboriginal Australians during this time period, as evidenced by radiocarbon dating. In an archaeological dig in Parramatta, Western Sydney, it was found that the Aboriginals used charcoal, stone tools and possible ancient campfires. 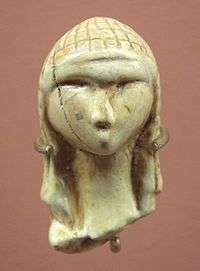 Last Glacial Maximum: Venus of Brassempouy, Grotte du Pape, Brassempouy, Landes, France, created. It is now at Musée des Antiquités Nationales, St.-Germain-en-Laye. Venus of Willendorf, Austria, created. It is now at Naturhistorisches Museum, Vienna. Artifacts suggests early human activity occurred at some point in Canberra, Australia. Archaeological evidence of settlement in the region includes inhabited rock shelters, rock paintings and engravings, burial places, camps and quarry sites, and stone tools and arrangements. 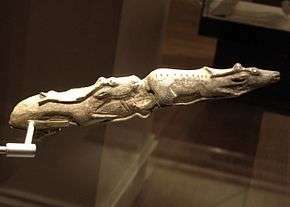 Ibex-headed spear thrower, from Le Mas d'Azil, Ariège, France, is made. It is now at Musée de la Préhistoire, Le Mas d'Azil. Hall of Bulls at Lascaux caves in France is painted. Discovered in 1940. Closed to the public in 1963. Lamp with ibex design, from La Mouthe cave, Dordogne, France, is made. It is now at Musée des Antiquités Nationales, St.-Germain-en-Laye. The Aurignacian culture was located in Europe and south west Asia, and flourished between 32,000 BC and 21,000 BC. It may have been contemporary with the Périgordian (a contested grouping of the earlier Châtelperronian and later Gravettian cultures). The Solutrean culture was located in eastern France, Spain, and England. Solutrean artifacts have been dated to around 19,000 BC before mysteriously disappearing around 15,000 BC. ↑ "Pleistocene Homo sapiens from Middle Awash, Ethiopia" (PDF). Nature. 423: 742–747. ↑ Rightmire, GP (2009). "Out of Africa: modern human origins special feature: middle and later Pleistocene hominins in Africa and Southwest Asia" (PDF). Proc Natl Acad Sci U S A. 106 (38): 16046–50. doi:10.1073/pnas.0903930106. PMC 2752549 . PMID 19581595. 1 2 John Weinstock. "Sami Prehistory Revisited: transactions, admixture and assimilation in the phylogeographic picture of Scandinavia". ↑ "In North America and Eurasia the species has long been an important resource—in many areas the most important resource—for peoples' inhabiting the northern boreal forest and tundra regions. Known human dependence on caribou/wild reindeer has a long history, beginning in the Middle Pleistocene (Banfield 1961:170; Kurtén 1968:170) and continuing to the present....The caribou/wild reindeer is thus an animal that has been a major resource for humans throughout a tremendous geographic area and across a time span of tens of thousands of years." Ernest S. Burch, Jr. "The Caribou/Wild Reindeer as a Human Resource", American Antiquity, Vol. 37, No. 3 (July 1972), pp. 339–368. ↑ Attenbrow, Val (2010). Sydney's Aboriginal Past: Investigating the Archaeological and Historical Records. Sydney: UNSW Press. pp. 152–153. ISBN 978-1-74223-116-7. Retrieved 11 Nov 2013. ↑ Stockton, Eugene D.; Nanson, Gerald C. (April 2004). "Cranebrook Terrace Revisited". Archaeology in Oceania. 39 (1): 59–60. Retrieved 11 Nov 2013. ↑ Sandra Bowdler. "The Pleistocene Pacific". Published in 'Human settlement', in D. Denoon (ed) The Cambridge History of the Pacific Islanders. pp. 41–50. Cambridge University Press, Cambridge. University of Western Australia. Archived from the original on 16 February 2008. Retrieved 26 February 2008. ↑ Gary Presland, The First Residents of Melbourne's Western Region, (revised edition), Harriland Press, 1997. ISBN 0-646-33150-7. Presland says on page 1: "There is some evidence to show that people were living in the Maribyrnong River valley, near present day Keilor, about 40,000 years ago." ↑ "Humans killed off Australia's giant beasts". BBC News. 24 March 2012. ↑ "The Trial Excavation at the Archaeological Site of Wong Tei Tung, Sham Chung, Hong Kong SAR". Hong Kong Archaeological Society. January 2006. Archived from the original on 3 March 2009. Retrieved 21 August 2010. ↑ Aboriginal Australia Art & Culture Centre. "Arrernte Aboriginal Art and Culture Centre Alice Springs". Aboriginalart.com.au. Archived from the original on 24 May 2011. Retrieved 30 May 2011. ↑ Gillespie, Lyall (1984). Aborigines of the Canberra Region. Canberra: Wizard (Lyall Gillespie). pp. 1–25. ISBN 0-9590255-0-2. ↑ Lloyd, J. & Mitchinson, J.: The Book of General Ignorance. Faber & Faber, 2006. ↑ Carpenter, Jennifer (20 June 2011). "Early human fossils unearthed in Ukraine". BBC. Retrieved 21 June 2011. ↑ Gary Presland, Aboriginal Melbourne: The Lost Land of the Kulin People, Harriland Press (1985), Second edition 1994, ISBN 0-9577004-2-3. This book describes in some detail the archaeological evidence regarding aboriginal life, culture, food gathering and land management, particularly the period from the flooding of Bass Strait and Port Phillip from about 7–10,000 years ago, up to the European colonisation in the nineteenth century. ↑ Dousset, Laurent (2005). "Daruk". AusAnthrop Australian Aboriginal tribal database. Archived from the original on April 9, 2011. Retrieved 27 August 2012. ↑ "Aboriginal people and place". Sydney Barani. 2013. Retrieved 5 July 2014. ↑ Thorley, Peter (2004). "Rock-art and the archaeological record of Indigenous settlement in Central Australia". Australian Aboriginal Studies (1). Retrieved 18 June 2011.